Hey!! What color did u use on last picture with cilent with bangs an the other cilent on the phone? LOVE!! is that redken eq shades? canu tell me the names of the color? =) thanks! I’m sorry I see you did comment on the picture you were refering to. Fist picture is 8.21 Lou color on base. platinum with 40 Vl lightener for balayaged highlights . No toner. Second photo w/ bangs is highlights alternating platinum lightener w/ 20vl developer and 901s w/40vl majiblonde. 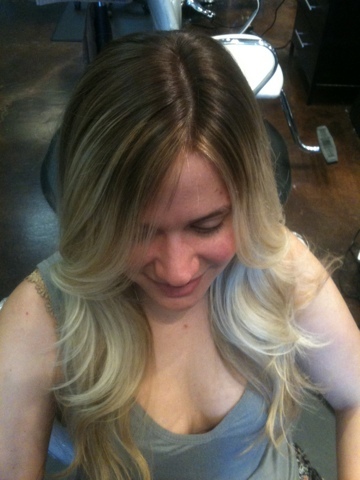 Low lights are light brown and dark golden blonde equal parts dia color. 9vl Toner p01 luo color 25vl to break base and tone. . All Loreal professional products.